This week I went to visit the exhibition ‘Finding The Value’, at York St Mary’s, a deconsecrated medieval church which opened as a contemporary art space in 2004 and operates alongside York Art Gallery to commission works by contemporary artists. The exhibition ‘Finding The Value’ is the the result of one such commission, which came about due to a bequest by Peter Madsen and his sister Karen, of a large collection of art, including paintings, books, prints, small sculptures and ethnographic objects. As the catalogue describes: “Finding The Value is an exhibition in which commissioned artists respond to items from the collection and open up questions of the inheritance of cultural values. Peter Madsen left all of his collection to York Art Gallery, giving the gallery the option to sell any pieces not accessioned into the collection. Of course some works immediately suggested themselves on a basis of historical importance and artistic quality as desirable additions to the permanent collection… Other works could be readily assigned a market value, sold at auction and so happily passed to the care of other collectors and a financial benefit gained”. It was decided that the gallery would commission five artists to respond the reduced collection of ‘lesser value’ items, in order to produce new work based on the individual items as well as the bequest as a whole. As there was no restriction placed on the use of the collection, the artists were invited to work directly on, or with the items. Seeing this in practice felt quite subversive and contributed to the overall questioning of how history is preserved and which items are deemed valuable for future generations. The artists approached the work using a range of methods and techniques. Through formal and material research and historical background information, they produced creative responses to the collection, in an effort to “investigate and develop the values and cultural meaning of the original work.” However, as individual bodies of work, each interpretation was unique in form and concept, allowing the artists’ practices to be highlighted, and affording consideration to the different possibilities and methods of viewing a collection. Positioned first in the space was Yvette Hawkins’ work ‘Casing In’. 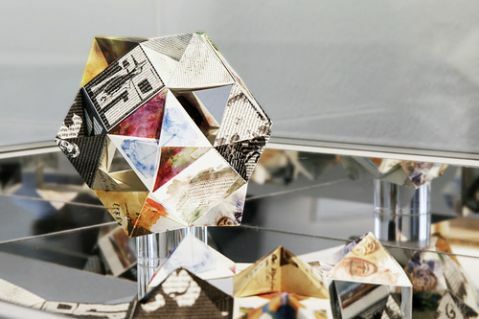 Utilising her skills as a paper artist, she chose the Japanese books and prints to work with. On noticing the perforations in the paper which had been made by insects, she decided to work directly with silkworms to introduce an element of non-human craft. The installation included three small floor-based vitrines with kneeler cushions supplied to view the work. The impact of viewing the work in this way created the additional effect of highlighting the theological surroundings as well as reflecting perceived reverence to art and museums. The poignancy of the silkworms being required to die before the results of their labour could be harvested was also a fitting metaphor for the surroundings. From the quiet contemplation of the silkworm cocoons, the next exhibit, required more physical interaction. Created by Simon Venus, the three vitrines of kinetic sculpture entitled ‘Passed On’ were suggestive of a religious triptych, and included various small sculptures and images from the collection which had been mechanised to respond when the visitor pressed a button. Next came Alison Erika Forde’s contribution, which reflected on how Madsen might have displayed his collection in his own home, whereas Andrew Bracey’s ‘Reconfigure Paintings’ attempted to create an equivalence between disparate prints and images by applying the artist’s own systematic approach to erasing the figures with colourfully painted geometric shapes. The work that interested me the most in terms of this project however, was Susie Macmurray’s piece, ‘Legacy’. The selected objects wrapped in gold wire and stacked together in the suitcase seemed to reflect both the religious setting of the work, and the nature of the [art] gift, its value, and our perception of it. I have previously discussed concepts of the gift and would be interested to see more of Macmurray’s work in relation to this. Since I’ve been researching art in museum practice, I’ve begun to notice more and more artists working with collections. In a way this feels somewhat reassuring as there is obviously an interest in the field in which I am working. However, it also means that I need to consider my approach to collections carefully in order to ensure originality in my work. With that in mind I decided to visit some current exhibitions to see how artists were responding to museum objects. ‘The Paper Museum’ at Graves Gallery in Sheffield is one such exhibition. Artist Paul Evans produced a series of drawings based on Museums Sheffield’s collections of animal drawings, paintings and sculptures in response to a Leverhulme Trust funded residency with Cardiff Osteological Research Group. The title of his exhibition refers to another paper museum, The Museo Cartaceo, which was created by 17th Century scholar Cassiano dal Pozzo. In compiling his museum, dal Pozzo collected over 7000 watercolours, drawings and prints to create a visual encyclopedia of the range of human knowledge. Evans was introduced to the poet A B Jackson through previously working with poets in conjunction with his drawing practice and they decided to collaborate on the Paper Museum project. Jackson described his working process as follows: “When Paul and I discussed how best to approach the writing of poems to accompany his A-Z drawings we agreed that any attempt to provide a summary explanation of the creature’s mythological story or cultural meaning would be difficult; instead we decided that the poems should be suggestive rather than straightforwardly descriptive, and I settled on a very strict form of four lines, each with four beats, and a rhyme scheme of ABAB. In addition, lines 1 and 2 run on together, while lines 3 and 4 are standalone sentences. The highly structured and formalised process of arranging the drawings according to an alphabetical narrative reflected the museum classification process perfectly, while the element of interpretation through text and image allowed space for the viewer’s imagination. The inclusion of additional drawings alongside the ‘bestiary’, such as that of a spade-toothed whale (which has never been seen alive) or the ‘Endling’ drawings of the last examples of a species, also explored ideas of the loss and conjuring that the collector enacts. I was also interested in the use of the alphabet (another linguistic organising structure) to create a finite boundary of knowledge. Such structures were effective in the dawn of museums due to the possibility of collecting the world’s existing knowledge. However, increasingly, artists working in museums are exploring how the museum structure frames knowledge in order to create a consistent narrative. This naturally requires an editing process where many objects will not be included. Any critique of museum classification structures using those same processes should therefore attempt to show how these structures impact on which objects (or knowledge) is included. The British Folk Art exhibition and subsequent catalogue were borne of a collaboration between curators Martin Myrone and Ruth Kenny, and Jeff McMillian, an artist specialising in American folk and outsider art. As Curtis stated, the exhibition aimed to challenge perceptions of folk art as “the work of an unknown amateur artist”, by revealing the stories of its makers and the contexts in which the works were created. Through categorising the works into genres, such as place and function, Curtis also suggested that the exhibition enabled the viewer “to think about folk art within categories that are usually reserved for fine art – notably figuration and abstraction” (Curtis, 2014, pp. 6-7). Although the bricolage nature of the exhibition layout somewhat belied these claims, I nevertheless enjoyed the installation effect of the grouped objects within the space. The exhibition catalogue also included essays by the three curators, the first of which was entitled ‘The House that Jack Built: Essay as Sampler’ by Jeff McMillan. Here he discussed attempts by the curators to define British folk art within the limitations of a single survey exhibition. Drawing on contemporary interests in the genre, such as Tracey Emin’s quilts, Grayson Perry’s pots, and Bob and Roberta Smith’s signs, McMillan described how they aimed to trace traditional approaches to art making between the 17th and mid-20th centuries. He also distinguished the tradition of folk art from its closest companion, outsider art, which he described as generally denoting “a self taught artist working in a particularly idiosyncratic, highly individual manner, often driven by compulsion, desire or religious fervour” (McMillan, 2014, p12). However, without a concrete definition of folk art per se, they decided instead to “approach the exhibition as a preposition… select[ing] works that inherently reflected certain territories and themes, such as the town, the sea, and the countryside, or alternatively, formal considerations like the figurative vs the abstract or non-representational”. Additionally, film and photographic archival works were included, showing the works of art in context, as well as acting as replacements for ephemeral objects which were no longer available. Ruth Kenny further interrogated the discrepancies between folk and outsider art in her catalogue essay, ‘Wallflowers at the Dance of Western Civilization: the Limits of Folk Art’, the title based on a quote from Jane Kallir. Speaking about how folk art has come to encapsulate all art forms outside the canon, she outlined how formal similarities between the works have led to folk art becoming such a broad category, often “shaped by the use of found materials, varying levels of technical skill and idiosyncratic construction” (Kenny, p126, 2014). Martin Myrone’s essay considered the legacy of the exhibition and if/how institutions such as the Tate could engage with the history of folk art, given that “folk art was among the categories traditionally considered beyond the remit of the Tate gallery that were brought into reconsideration in planning the new Tate gallery of British Art at the end of the 1990s”. Since that time, workshops and temporary exhibitions on folk art in the museum have been organised, which built on previous enterprises by artists and individuals dedicated to preserving the history of folk art. These included the Museum of ‘Bygones’, Kirkgate at York Castle Museum, and most recently the Folk Archive by Jeremy Deller and Alan Kane. Such interests, which include artists revisiting early collection apparatus including the Kunstkammer and Wunderkammer, are symptomatic of a less disciplinary way of thinking, and thus not only allow for a re-engagement with artworks outside the canon, but also, conversely, for art history to be considered as part of a social system, using these same methods.